This adapter gives you the ability to use your irreplaceable prime lens with your new camera and saves you the cost of purchasing new lenses. 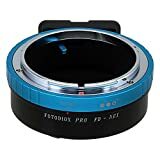 Fotodiox ‘Pro’ Series adapters are made with precision and pristine award standards to insure the perfect fit for your camera and lens and to endure professional use. The unique styling maintains/enhances professional appearance. This adapter allows Canon FD Lenses to fit on a Sony Alpha E-Mount system camera body. It also has a removable tripod mount to help bear the weight of heavier lenses. Automatic diaphragm, auto-focusing, and other functions will not operate correctly while using this adapter as it is not electronic. In this case, “stop-down mode” will need to be used when metering since the lens does not have the ability to have its aperture controlled by the camera body. Infinity focusing is allowed.